Click on each of the thumbnails to view in gallery. 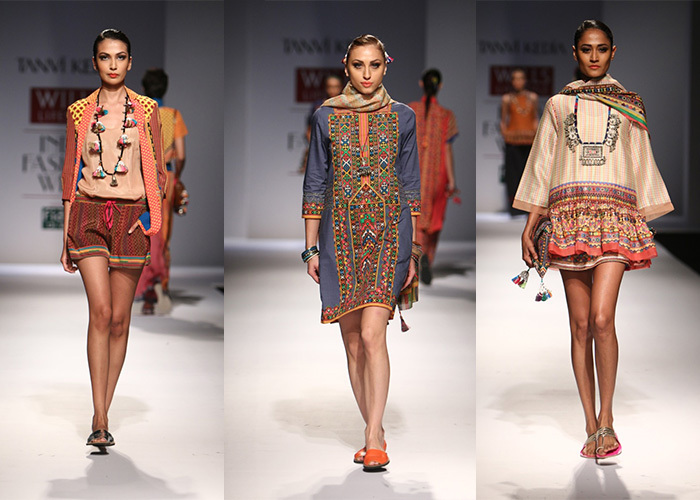 Each and every one of Tanvi Kedia’s ensembles came with intricate detailing, lively colours and exciting prints. Matching necklaces and bags were the highlights of this collection. 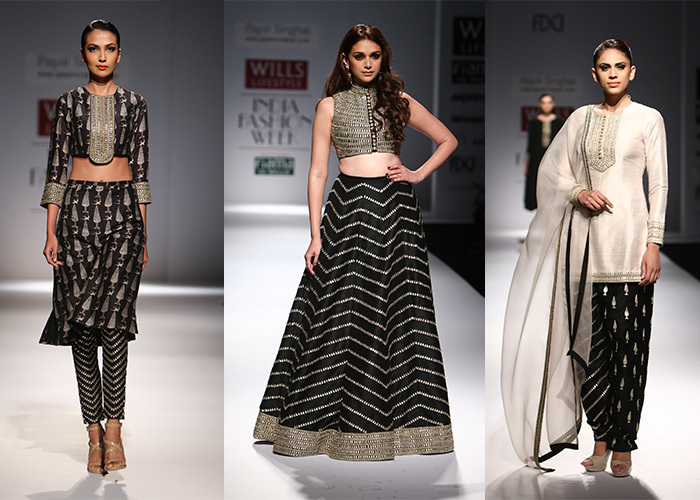 While Payal Singhal toned it down with a monochromatic wardrobe dedicated to the Gulmarg valley of Kashmir. 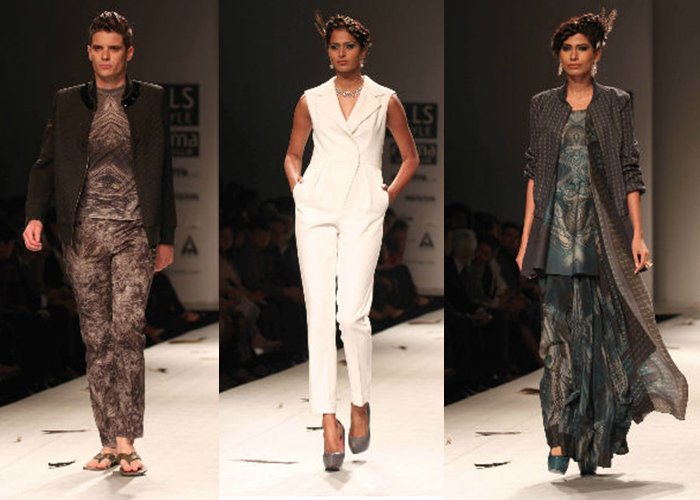 Nachiket Barve’s collection was a trip to the wild side. The use of applique, embroidery and prints from Africa made this collection a visual treat. On the other side Shivan & Narresh introduced the swimdress, the resort suit and the fringed dress, inspired by the works of Calder. Their palette took a primary route using vermillion, azure blue and chrome, while moss worked beautifully for caramel Indian skin. 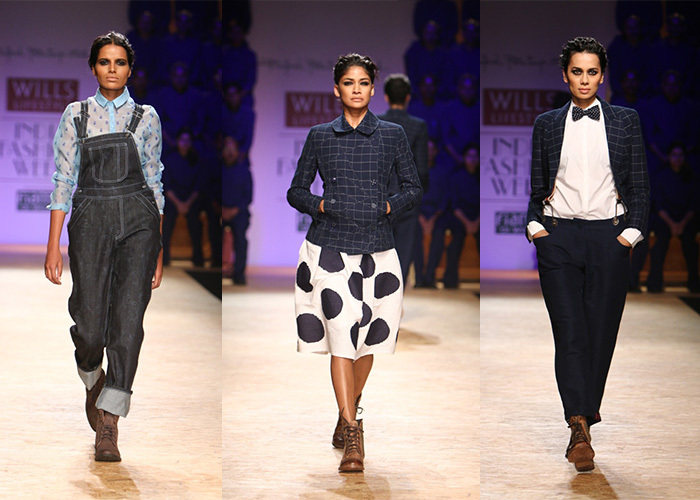 Paying tribute to the denim industry, Rajesh Pratap Singh brought back jeans in pure indigo. With quirky hand and machine embroideries, chikan embroideries interspersed with pintucks, and patchwork jackets, the designer aimed for individuality. 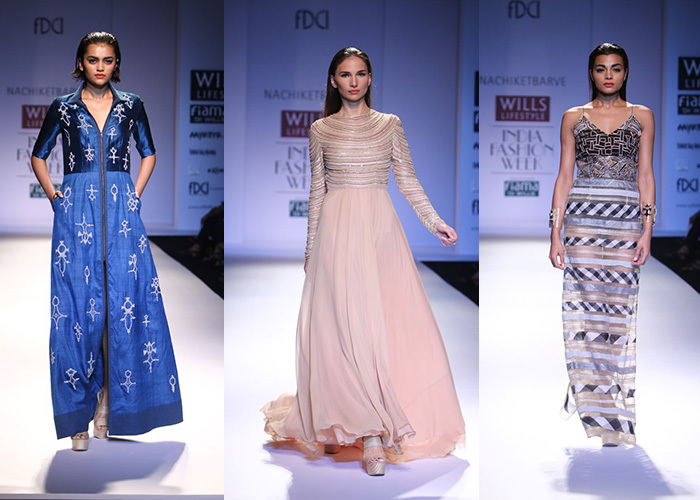 Anupama Dayal defined her Spring Summer collection in varying shades of boho chic. 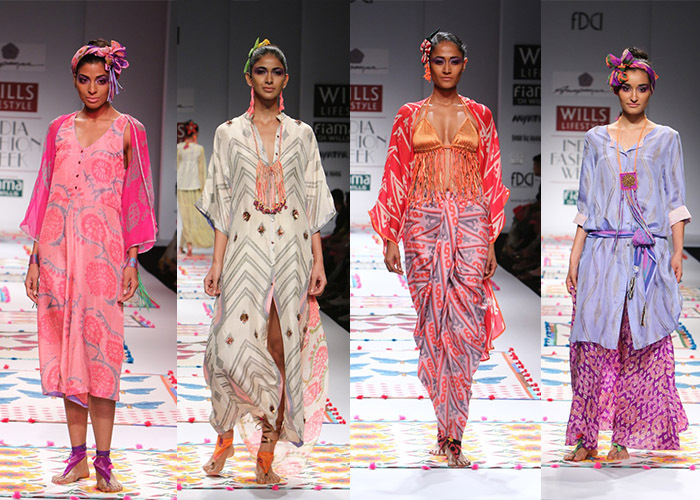 The most colourful collection of the season, there were kaftans, kurta dresses, palazzo pants and shift dresses. 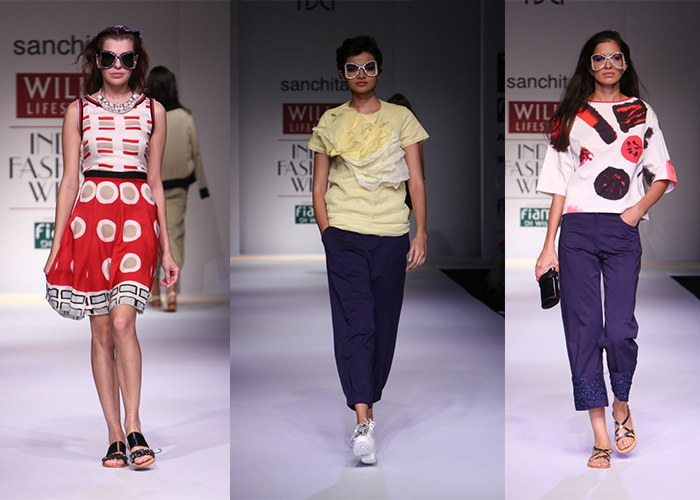 Aptly epitomising the joys of summer, we loved the use of Indian prints and bold imagery. Sanchita couldn’t go wrong with her efficient colouring and patterning. Her idea of summer revolved around a casual wardrobe, sheer dresses and quirky shades. Ashish Soni’s collection dappled with stiff jackets, dapper suits, cigarette pants and vibrant camouflages, taking formal wear to the next level. The shine and glint on the suits are bound to add that swagger element to a boring day at the office. 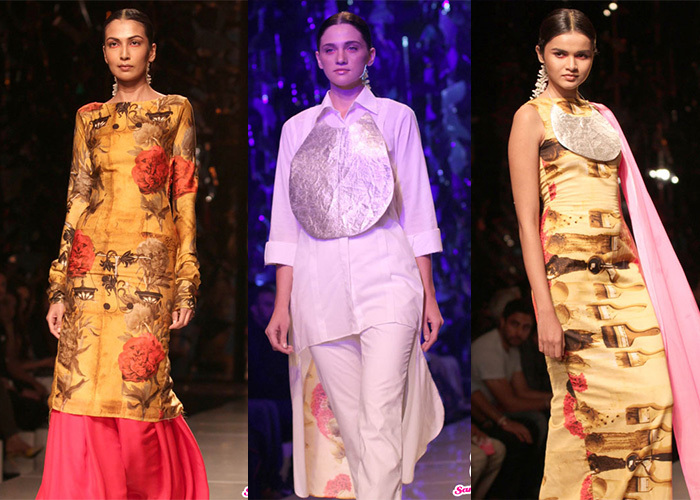 Known for her quirky designs, Masaba retained her bold signature style motifs. In bright shades of yellow, the collection saw plate chains of silver and gold, and beautifully decorated braids with orange and white jasmines. The bold metallic colours seen on the ramp completely personified Gen Y. Missed our earlier posts? Check out Day 1 and Day 2 here.